Ian and I have been traveling for almost a year now, and we have hiked thousands of miles of trails across the country. The Oregon Coast was one of the biggest surprises that was have discovered during our travels. Neither of us had heard that much about the Oregon Coast prior to visiting the coast, but it’s fantastically beautiful. 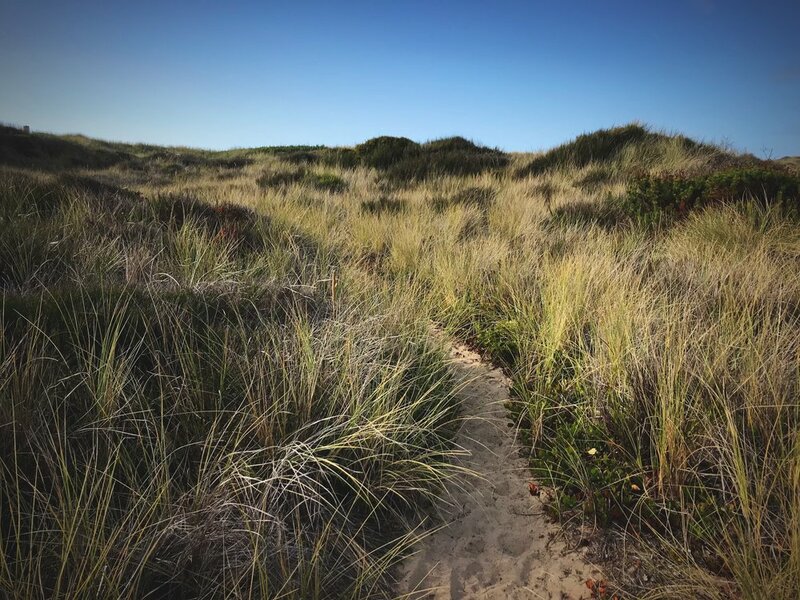 The biggest surprise of all was the John Dellenback Dunes Trail, which is one of our favorite day hikes we have ever done. Striking a pose on the top of the tallest dune as the sun sets over the ocean. The end of the trail leads you a beautiful stretch of misty beach, and you’ll likely have it all to yourself. 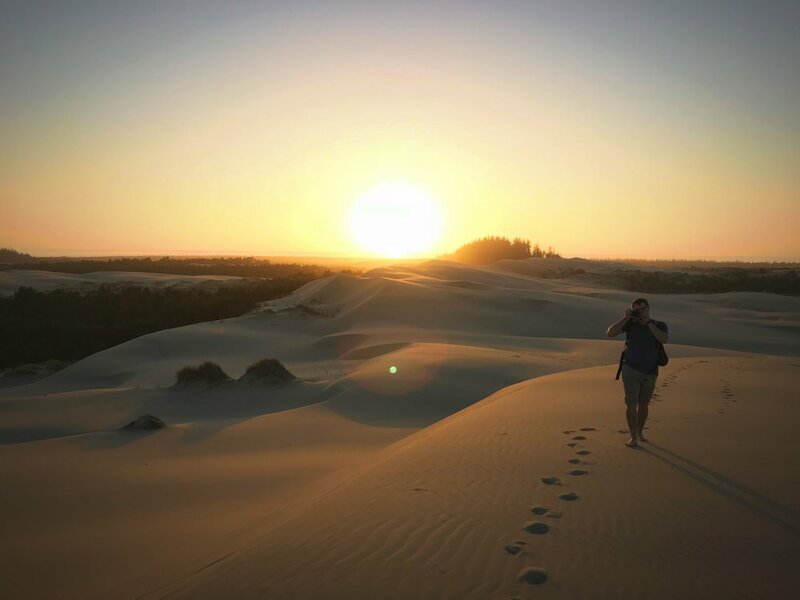 The John Dellenback Dunes Trail is located in the Oregon Dunes National Recreation Area. 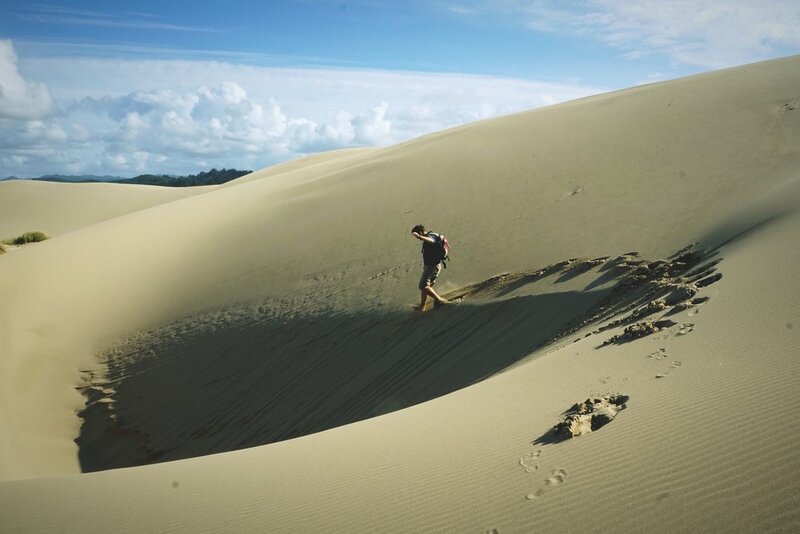 The area of dunes stretches 40 miles between Florence and Coos Bay, Oregon, and is the largest area of coast dunes on the North American continent. As you approach the dunes on Highway 101, there are areas where the sand actually butts right up against the highway and have begun to sweep over the shoulder. The trail begins at a trailhead near the Eel Creek Campground. The day use fee is $5, but if you have an America the Beautiful Federal Lands pass, it’s free. The hike begins with a half mile walk through an area of coast forest that includes, salal, rhododendron, kinnikinnik. We met a very sweet black cat along this section of the trail. Every trail would be enhanced if a black cat crossed our path. You might not want to walk the whole way barefoot, but take your shoes off at some point. Give yourself a little extra time, because the trail is kind of hard to walk on. Soon you emerge from the forest onto indescribably vast piles of sand. We immediately took our shoes off and walked the next two miles barefoot. The tan sand grains are exquisitely uniform, and it’s soft to walk on. Posts along the dunes lead you from the forest to the beach at the end of the hike. The trail is only six miles round trip, but it feels longer because the soft sand is kind of difficult to walk on. Besides the challenging texture of the trail, you’ll want to give yourself plenty of time to explore the peaks and gullies of the area. As the sun started to set Ian was in photographer’s heaven! These posts help you find your way through the dunes and to the beach. When the wind blows the grass over, the blades trace these patterns in the sand, like a natural zen garden. In some windblown areas the sand is very firm. In some areas the sand has been blown and piled so steeply that it’s reached its angle of repose or terminal slope of 33.3 degrees. At the angle of repose the sand cannot continue to pile any longer and begins to slump. At the top of these slopes, are “razor edges,” where there is a sharp drop off at the top of a dune. You can see how the sand reaches a terminal slope creating these hard lines throughout the dunes. The Oregon Dunes are a giant grownup sand box. In other places there are sudden strange holes in the sand called Witch’s Eyes. In these holes the sand just seems to mysteriously drop off. While these holes can be really dangerous for people on four wheelers, they are completely fun to slide into and then struggle to get out of while hiking. Approaching a huge witches eye that we found on one of the dunes. Ian running into the witches eye. 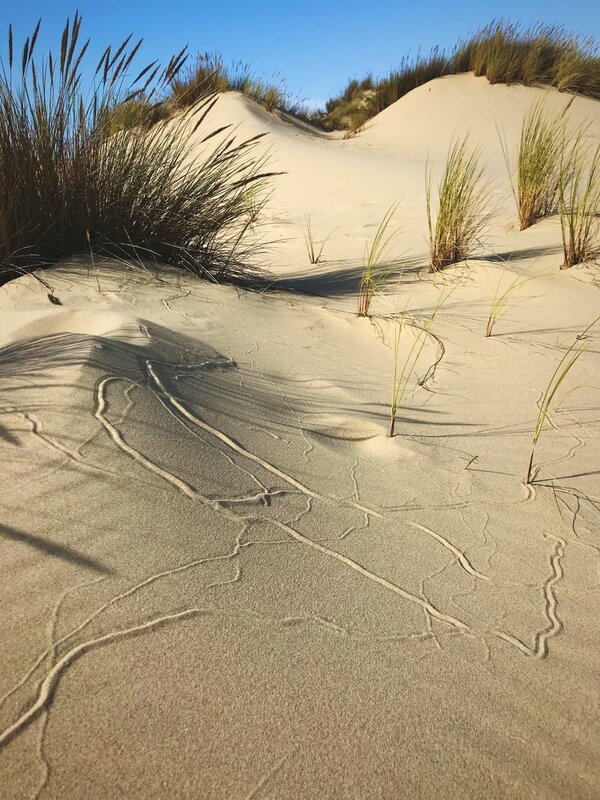 While other areas of the Oregon Dunes National Recreation Area are open to OHVs, the area surrounding the John Dellenback Dunes is closed to motorized vehicles. We enjoyed the peaceful atmosphere of the trail. When visiting other dunes, we have been disappointed by there being so much OHV traffic that we haven’t even been able to walk on the dunes safely. The dunes are that much more beautiful because they don’t have the tracks from ATVs and dune buggies. We only saw a couple other people on the trail while we were hiking even though it was a warm Friday afternoon, but even if you hit the trail on a busy weekend, you might not see that many footprints. The high winds off the coast and the open area cause the dunes to shift rapidly. In areas where the sand was windblown, our footprints were the only ones around. As the day wore on, and the shadows lengthened, the Oregon Dunes only became more dramatic. The areas of sand that are unstable and shifting are totally devoid of life, giving the feeling that you are in a sea of sand. But in areas where the sand has been stabilized, gray-green grasses punctuate the rolling dunes. In the low areas there are some islands of scrubby pines and salal. Before you get to the ocean, you have to cross a strip of trees. In some places the trees are so dense the trail is a tunnel. The mossy trees make you feel like you are in the Forbidden Forest at Hogwarts. 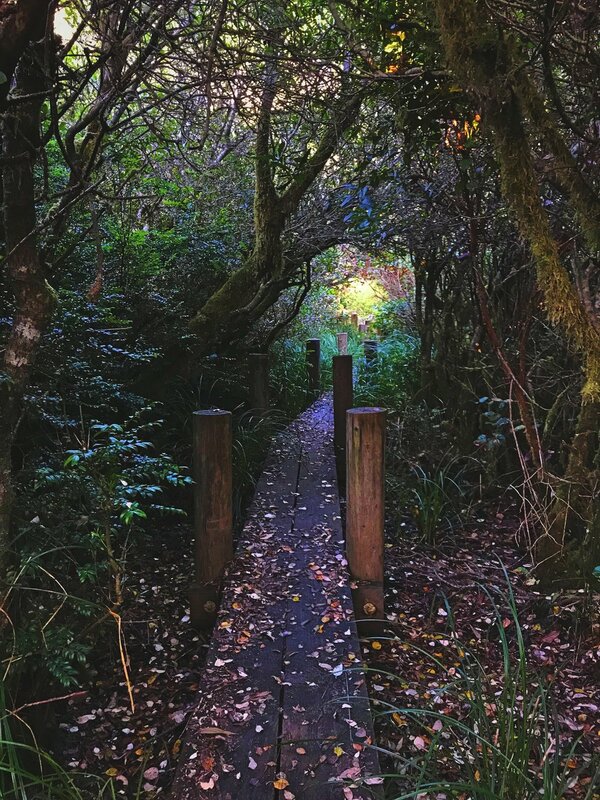 These wooden boardwalks make this part of the trail even more charming. Right before you arrive at the ocean you go through a large, dense strip of trees. 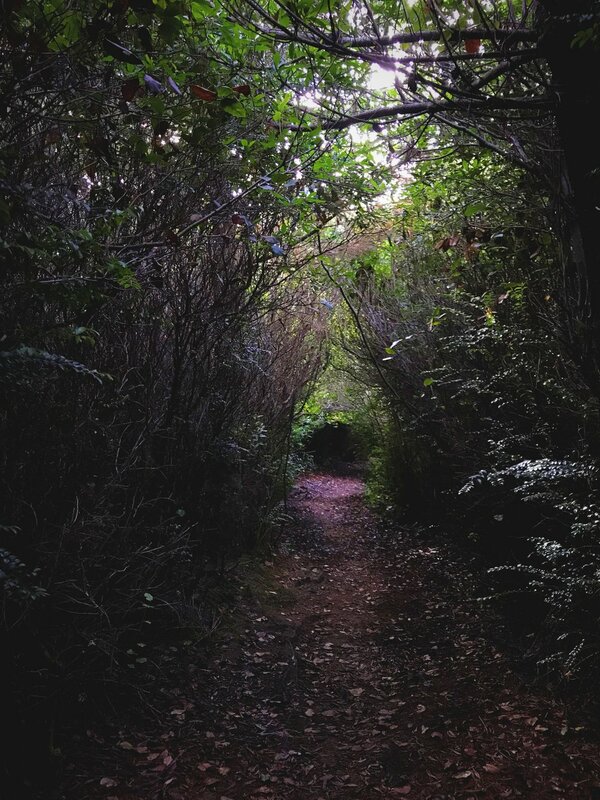 The trail leads you through a tunnel of shrubbery in some places, and it feels like you are in a secret garden. Beyond that there is an area of board walk that goes through a wetland area of sedge grasses and tangled mossy trees. This part of the John Dellenback Dunes Trail has such a different dynamic than the rest of the trail. 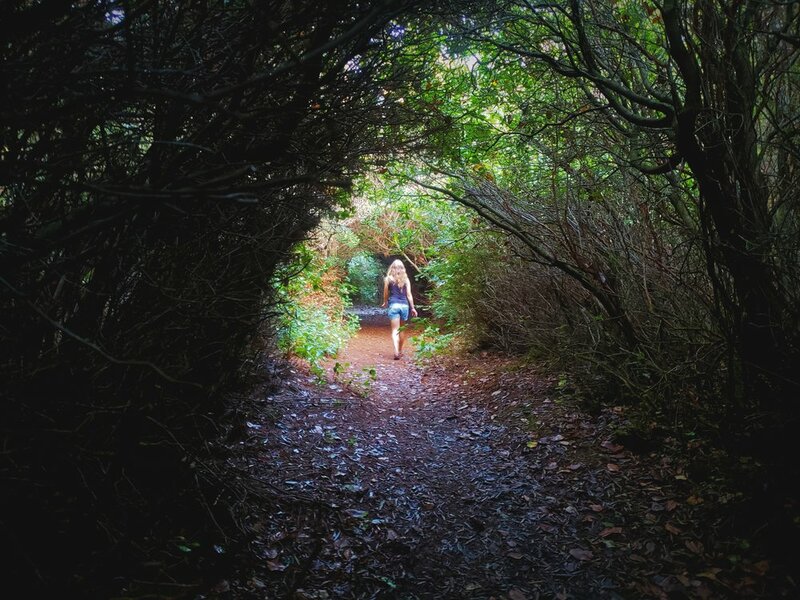 The trail is just a thin path through grasses and salal right before you arrive at the water. 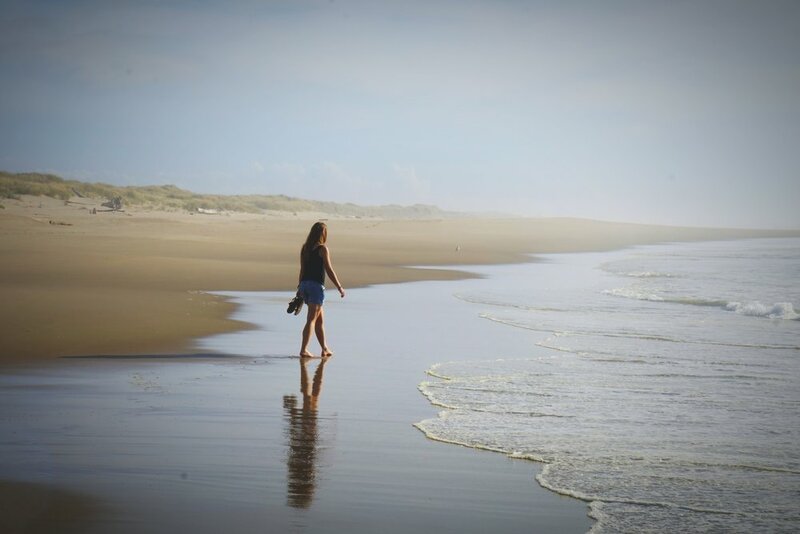 And just as suddenly as you arrived at the dunes, you arrive at the ocean. The beach is vast and unlike many other places on the Oregon Coast, there are no rocks off shore or no craggy headlands in view. It’s gorgeous sand and misty waves as far as the eye can see. There are no rocks off shore, it’s just open ocean. Since you have to walk 6 miles through thick sand to get to this beach, you’ll likely have the beach all to yourself. We arrived at high tide, and the waves were crashing heavily. It wasn’t great weather for swimming anyway, but we did notice some areas of rip currents. If you go in hot weather, watch out for these dangerously strong currents. Ian walking through the trees before you arrive at the ocean. 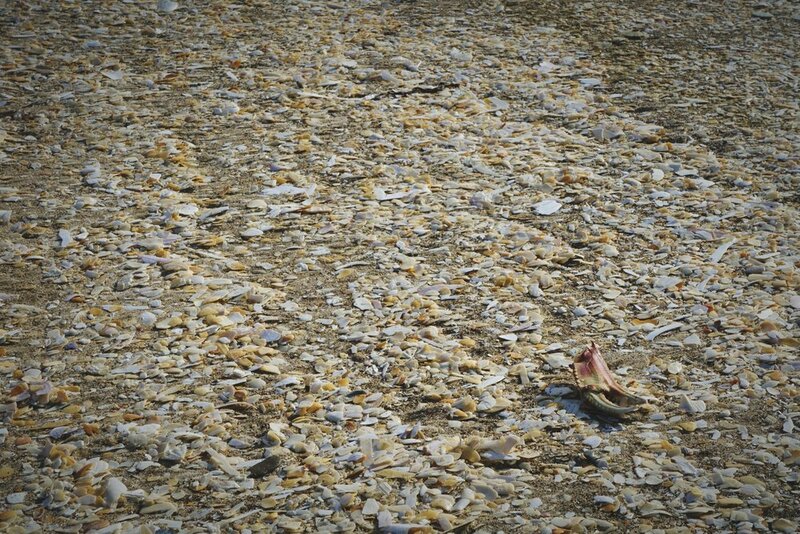 There are areas of the beach that are totally covered with broken shells. We spent over an hour just searching for unbroken shells. All over the beach there were broken shells that had been bleached in the sun. Down in the surf, there were unbroken shells, but the seagulls would quickly run in and peck at them to try to get some tasty morsels out of them. Ian was like a giant seagull, running out to sea as the waves swept out, trying to find unbroken shells. He had his pants rolled up above his thighs, but somehow he still managed to get soaked. He did find four unbroken delicate sand dollars though! We decided to stay and watch the sunset from the highest dune. The sand dunes became a blueish gray color as the sun sunk below the horizon. 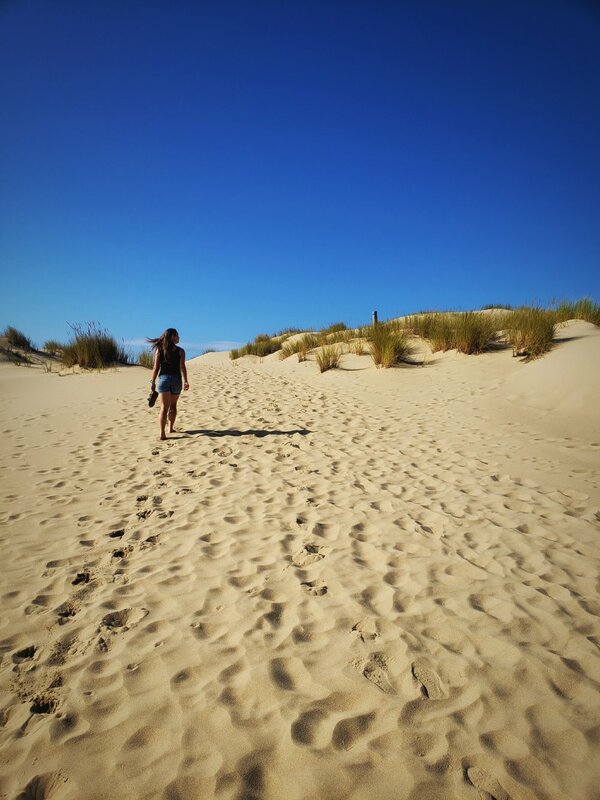 The John Dellenback Dunes Trail is one of our favorite day hikes. As the day wore on, we began our hike back to the van. With the sun low in the sky, long dramatic purple shadows were cast upon the dunes, accentuating folds and arcs in the dunes that we hadn’t even noticed before. 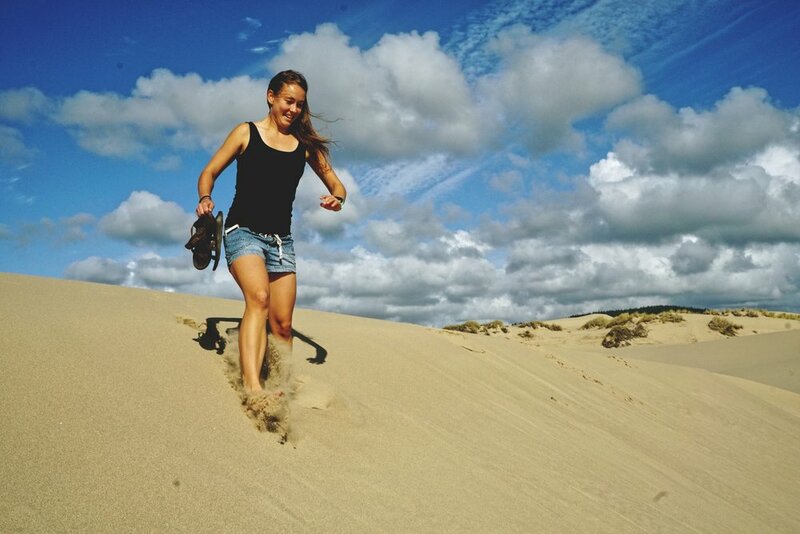 When we arrived at the final and largest dune, we decided to climb it. With just 10 minutes until sunset we decided to stay and watch the sun sink lazily behind the haze on the horizon. As we walked home, the moon was a silver biscuit dipping into a froth of pink clouds. Not only did we get to see the sunset, we got to see the moon rise. These scraggly shore pines somehow manage to survive in the poor soil of the dunes.